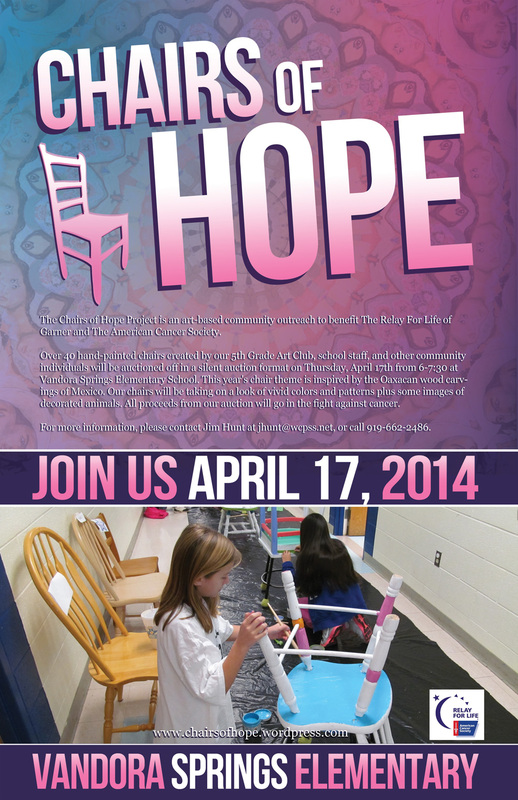 I’m excited to share the new Chairs of Hope media today! Below you can view the new poster design, as well as the mini-documentary I’ve been working on. Categories: Arts, Events, Graphic Design, Video Production | Tags: art club, art teacher, cancer, chairs of hope, design, elementary, fundraiser, jim hunt, relay for life, school, vandora, video production | Permalink. 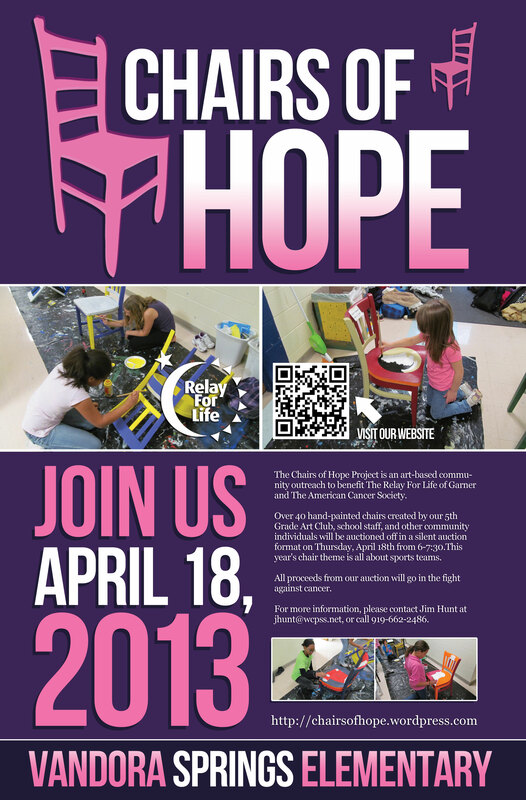 Chairs of Hope is an art-based community outreach project in which students & staff at Vandora Springs Elementary School in Garner, NC paint wooden chairs to raise money for the fight against cancer through Relay for Life of Garner. Each year, over 30 chairs are hand-painted with a specific theme in mind. 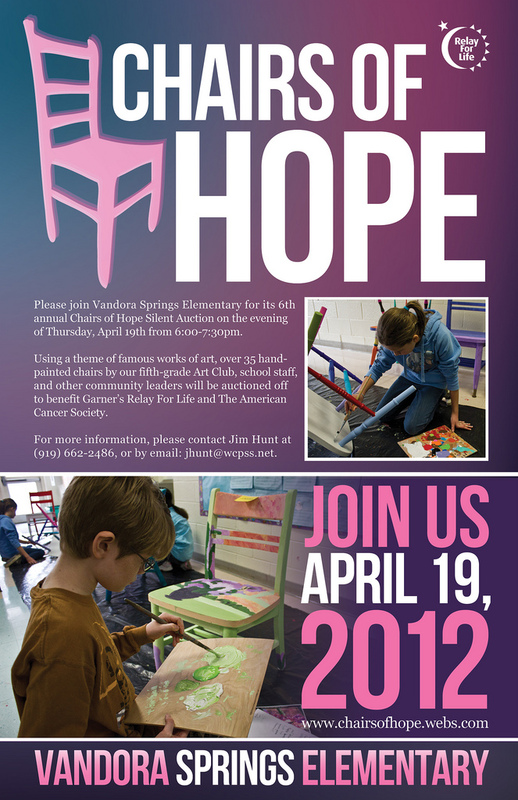 The finished chairs are then auctioned off in a silent auction format in April, with all the proceeds going to the American Cancer Society. Categories: Arts, Events, Graphic Design, Photography, Video Production | Tags: american cancer society, chairs of hope, garner, jim hunt, relay for life, vandora, vandora springs | Permalink. Categories: Arts, Events, Graphic Design | Tags: art club, chairs of hope, poster design, relay for life, vandora springs | Permalink.